The Marvel Universe’s Illuminati. A small group of the most powerful men banded together to make the hardest and grandest decisions for earth. First they were six: Iron Man, Mr. Fantastic, Professor X, Dr. Strange, Black Bolt, and Namor. Black Panther was asked to join but his conscience said no. Where would their power and desire to control end? Times have changed. 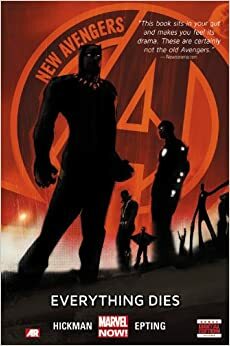 Black Panther witnesses an incursion event, where an earth from a parallel universe starts to cross over into their space. He sees the isolated overlap from his home nation of Wakanda, He also sees a mysterious group led by the Black Swan destroy that other earth. Black Panther calls upon the Illuminati (NOW! minus Professor X, but with Beast in his place, and Captain America) to help him discover her intent as well as what what these incursion events mean for a multiverse of worlds.